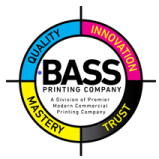 Bass Printing Company is a full service commercial and trade printer. Our goal is to provide our customers with the highest quality offset and digital printing at competitive wholesale prices. We manufacture and print a wide variety of products including:: business cards, newsletters, flyers, event tickets, door hangers, name badges, plaques, certificates, letterheads, envelopes, Security, catalog, booklets, manuals, manifestos, raffle tickets, 1, 2, 3-part forms, invoice pads/books, purchase orders, work orders, contracts, invitations and announcements (wedding & graduations, etc. ), personal scratch pads, hang tags, graphic design, digital printing and more.